The first release of ArcGIS Excalibur is now available! As mentioned in our previous blog, it is a premium web application for ArcGIS Enterprise 10.7 that provides users with tools and capabilities in a project-based environment that streamlines image analysis and structure observation management. ArcGIS Excalibur makes it easy to search and discover imagery available to you within your organization through a number of experiences. You can connect directly to an imagery layer, an image service URL, or even through the imagery catalog search. The imagery catalog search allows you to quickly search for imagery layers over areas of interest to discover and queue images for further use. Once you have located the imagery of interest, you can easily connect to the imagery exploitation canvas where you can utilize a wide variety of tools to begin working with your imagery. The imagery exploitation canvas allows you to view your imagery on top of a default basemap where the imagery is automatically orthorectified and aligned with the map. The exploitation canvas also enables you to simultaneously view the same image in a more focused manner as it was captured in its native perspective. Optimizing imagery to get the most value out of each image pixel is a breeze with ArcGIS Excalibur display tools. The image display tools include image renderers, filters, the ability to change band combinations, and even apply settings like DRA and gamma. Settings to change image transparency and compression are also included. Ever need to highlight key areas of interest through mark up, labeling, and measurement? 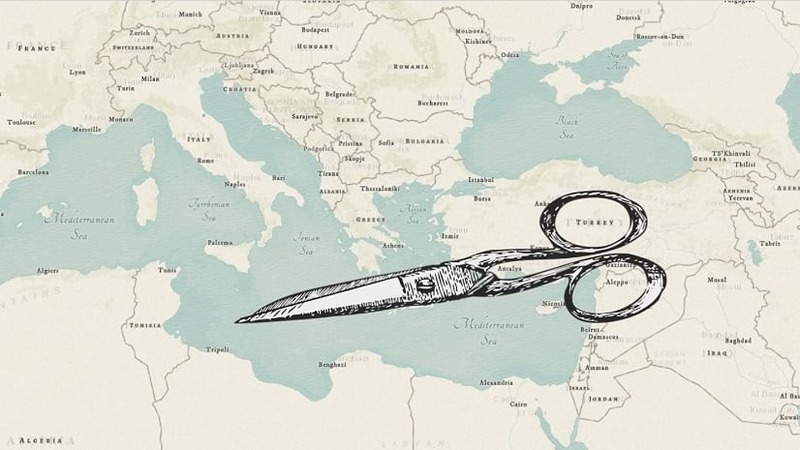 Through the mark-up tools, you can create simple graphics on top of your imagery using text and shape elements to call attention to areas of interest through outline, fill, transparency, and much more. The measurements tool allows you to measure horizontal and vertical distances, areas, and feature locations on an image. The exploitation results saved in an image project can be easily shared using the export tools. 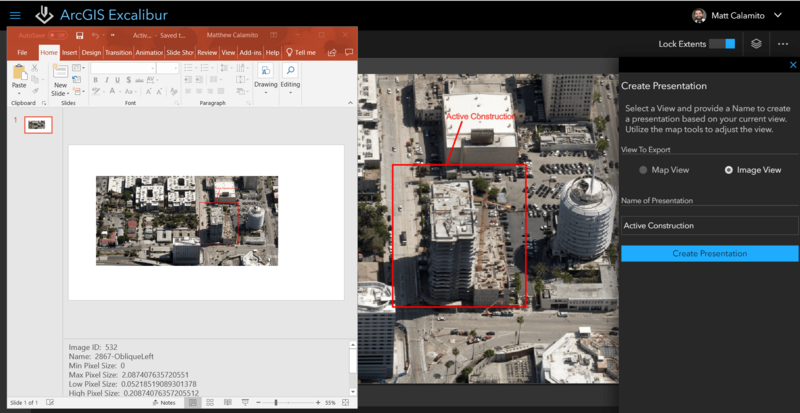 The create presentation tool exports your current view directly to a Microsoft PowerPoint presentation, along with the metadata of the imagery. ArcGIS Excalibur also introduces the concept of an imagery project to help streamline imagery workflows by leveraging the ArcGIS platform. 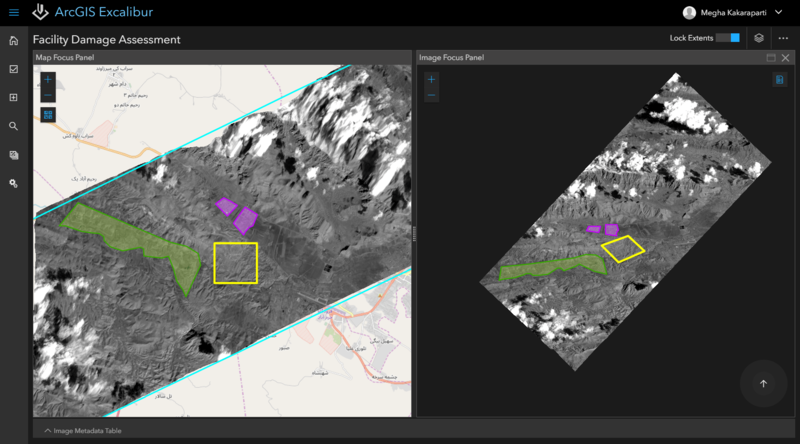 An ArcGIS Excalibur imagery project is a dynamic way to organize resources, tools, and workflows required to complete an image-based task. An imagery project can contain geospatial reference layers and a set of tools for a focused image analysis and structured observation management workflows. Content created within imagery projects can be shared and made available to your organization to leverage in downstream analysis and shared information products. ArcGIS Excalibur makes working with imagery a breeze! View all the features and capabilities from our ArcGIS Excalibur website. Contact us at arcgis-excalibur@esri.com to learn more. Megha is a Product Engineer based out of the Esri DC office. She works on writing documentation, product design, and testing.